This Demonstration simulates a microorganism's survival in water treated with a chemically unstable or volatile disinfectant. It generates the disinfectant's concentration dissipation curve, which can be smooth or wavy, and the corresponding survival curve using a simplified version of the Weibull-log logistic (WeLL) inactivation model. The survival curve is the numerical solution of an ordinary differential equation derived from the notion that under dynamic conditions, the momentary inactivation rate is the static rate at the momentary disinfectant concentration, at the time which corresponds to the momentary survival ratio. The effective concentration of most water-based disinfectants diminishes in time as a result of their chemical reactivity and volatility. Consequently, their antibacterial activity also diminishes. 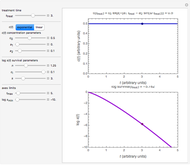 With this Demonstration, you can simulate smooth and wavy exponential and linear concentration dissipation patterns, vs. , using the model functions and , respectively, where , the initial concentration, and and are all entered with sliders, and . According to this model, setting produces a constant disinfectant concentration and produces a smooth exponential or linear concentration, as you choose. 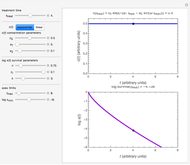 In the linear decay case, since cannot be negative, the program sets any such value to zero. Notice that according to either model, the slope of any wavy concentration dissipation curve is always negative or zero, , consistent with the fact that the disinfectant concentration cannot rise spontaneously. The organism's resistance to the chemical agent is described in terms of a simplified WeLL inactivation model. 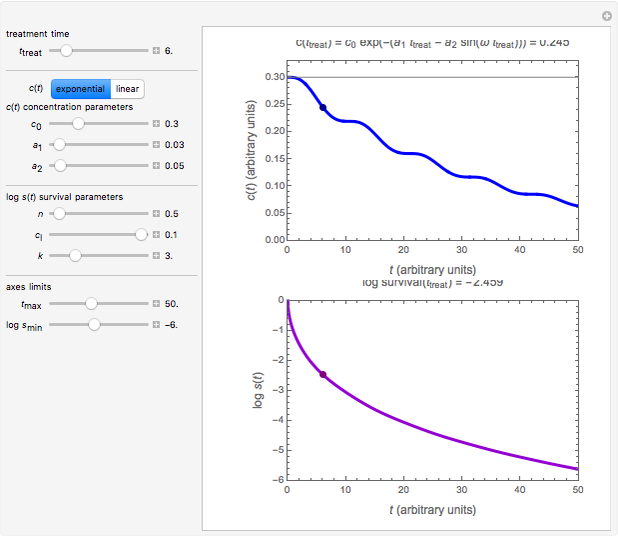 According to this model, any isoconcentration survival curve follows the Weibullian model , where is the survival ratio, , and is a constant. The parameter , marks the lowest effective disinfectant concentration and is the slope of at . 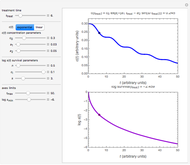 If , the static survival curve has downward concavity and if , upward concavity. If , the survival curve is log linear (first-order kinetics). 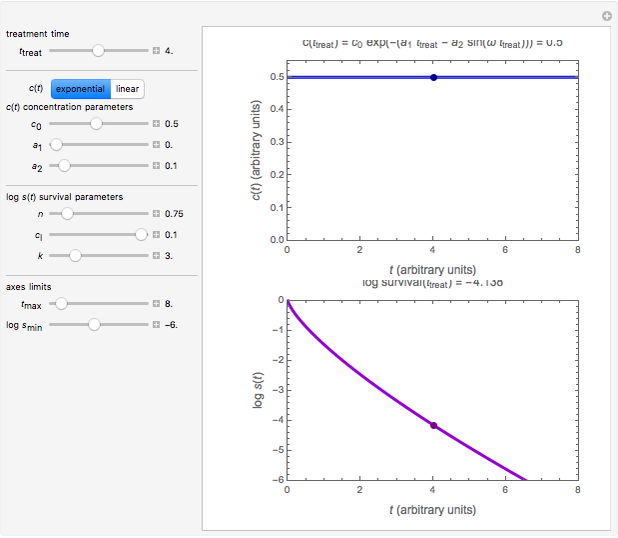 The generated dynamic survival curve is calculated on the assumption that the momentary inactivation rate is the static rate at the momentary disinfectant concentration, at the time that corresponds to the momentary survival ratio. This translates into a differential rate model [1–3] whose numerical solution is the sought survival curve. It is plotted below the disinfectant dissipation curve with the survival parameters entered by the user. 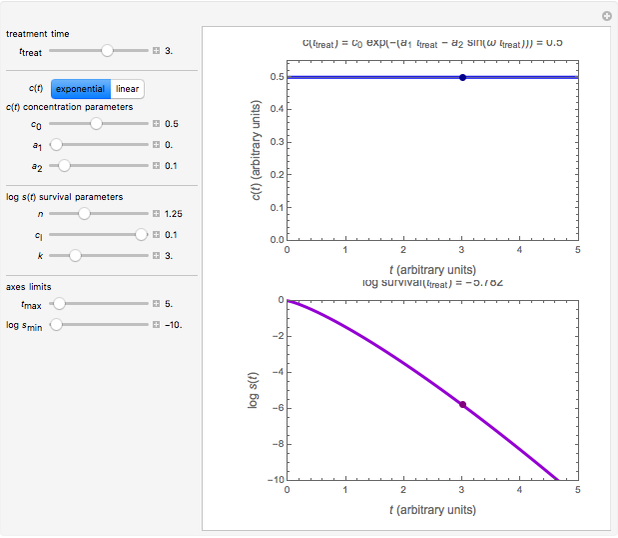 You can also chose any particular treatment duration, , with a slider, and the Demonstration will display the numeric values of the momentary concentration and corresponding survival ratio above their respective plots. M. Peleg, "Modeling and Simulation of Microbial Survival During Treatments with a Dissipating Lethal Chemical Agent," Food Research International, 35(4), 2002 pp. 327–336. doi:10.1016/S0963-9969(01)00124-7. M. G. Corradini and M. Peleg, "A Model of Microbial Survival Curves in Water Treated with a Volatile Disinfectant," Journal of Applied Microbiology, 95(6), 2003 pp. 1268–1276. doi:10.1046/j.1365-2672.2003.02104.x. Mark D. Normand, Claude M. Penchina, and Micha Peleg "Microbial Survival with Dissipating Disinfectant"